Looking for a good value? 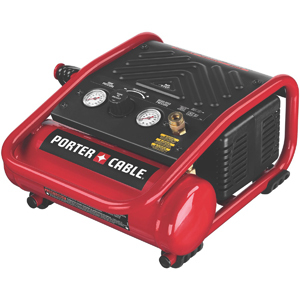 At under 35 pounds, the Porter Cable C2002 is one of the better portable air compressors for home use or light contract work. What sets this compressor apart from other portable compressors is its 6 gallon tank size. It might not make much of a difference if doing trim work, but when you need constant airflow such as when dusting off large areas, you’ll appreciate the air capacity. The Porter Cable C2002 is referred to as a pancake compressor, because of its flat oval shape. It is really easy to move because of its compact shape and light weight. The Porter Cable is one of the first I recommend to those who have bad backs and would have a hard time lugging around larger compressors. With the handle being centered, the good balance makes it super easy to carry around. The 6 gallon tank is a good size for most tasks and it allows the compressor to cycle on and off less. If you are purchasing the compressor with the included accessory kit, you will actually get a better price most times. That said, the accessory kit isn’t exactly the best quality but it will get you by until you’re ready to upgrade some of the components. Performance is surprisingly good. 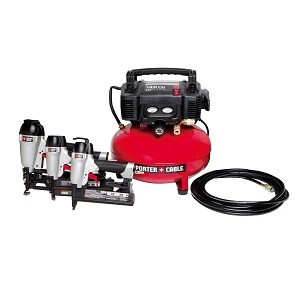 Whether filling car tires, using a finishing nailer or small disc grinder, the Porter Cable C2002 delivers. Operating at a max of 150 PSI (with a 120 PSI cutoff), it delivers 2.6 SCFM at 90 PSI. If you live in a colder climate, you’ll appreciate the low-amp, 120 volt motor which allows fast starts. Something that has come up about this compressor is that on slick surfaces, the C2002 has a tendency to slowly spin while in operation. You may want to take this into consideration if this would apply to you. The pump is oil free and the manufacturer claims that it requires no maintenance for the life of the machine. The motor is designed in a way that the brushes can easily be replaced if they ever need maintenance. The top of the unit features dual air couplers so two users can work off of the compressor at the same time or a single user can multitask. You can tell the engineers who designed the Porter Cable C2002 really spent a good deal of time on this project. It’s no surprise that the company has a long-standing reputation for putting out quality tools with long lifespans. At about 82 decibels, the C2002 is not the quietest but not any louder than other compressors with an oil-less pump. Don’t expect this compressor to be as quiet as some of the heavier, more expensive models but this noise level is to be expected for this category of air compressor. This compressor is a good match for the home user (male or female) who needs a powerful yet portable compressor. Probably not recommended for a professional contractor unless it served as more of a backup unit. I really like that the cord just wraps easily around the attached cord wrap, so I do not ever have to worry where I have to put the cord. 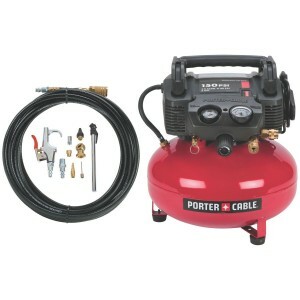 If you’re looking for an good performing, easy to use air compressor that is a cinch to move around, the Porter Cable C2002 may be your answer. To me, its 6-gallon tank gives it a big advantage over the smaller portable units with almost no increase in total weight. While the included accessories seem cheaply made, they will get the job done until you feel the need to upgrade them. All in all, the C2002 is a fantastic value for the light do-it-yourselfer.